Her job requires her to tolerate farting, pangs of body odour and kids who cough in her face. 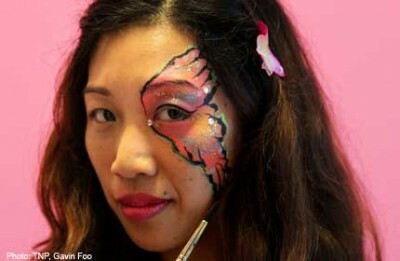 But face and body painter Queenie Ong grins and bears it, all in the name of being professional. "I'd be engrossed in creating a butterfly or a tiger around a child's eye or nose... then a cough hits. "I get bits of what comes out, because I am so close, right? "It's pretty common," she says, smiling at this reporter's expression of sheer horror. "I've also experienced getting the stink when a client breaks wind," she says with a chuckle, adding that adults usually conceal their farts better. Armed with a kit of body paints, brushes and sponges, this 36-year-old mother of one gets hired to let her creativity run amok on human skin, which she counts as her favourite type of canvas. "Sometimes I paint on paper, but the living canvas is my favourite," says the former lawyer, who is working as a teacher at enrichment centre The Learning Lab. When she is not among students, she dresses up as a fairy or unicorn to decorate the faces and bodies of kids and adults at functions like birthday parties, roadshows and charity carnivals. Demand for face and body painting here is growing, but it is not enough to depend on it for a full-time living, she says. In a month, she receives about four or five enquiries, a number which takes a hike during the June school holidays and festivities such as Halloween and Christmas. Ms Ong, who first picked up face and body painting about five years ago, does not bat an eyelid when she has to take the paintbrush to bare breasts, pot bellies or the protruding tummies of pregnant women. "After staring at body parts long enough, they simply become canvases. "There's nothing to be shy about," she says, claiming that moments of awkwardness between her and the client are few and far between. You've got to be professional about it, she adds firmly. She charges between $200 and $350 per engagement, depending on the time of the year she is being engaged, the complexity of the designs and type of materials used. The job is not without challenges. "Pregnant bellies make exceptionally dynamic canvases, since the babies within move as you paint. You've got to work around that." There are also health hazards. Creating the perfect masterpiece often involves crouching in uncomfortable positions for long periods of time, leading to lower back and shoulder aches. It's nothing a good massage and a thorough round of stretching won't solve, she says. Although she has only taken one professional course in face and body painting - she'll be taking another soon, she adds - she is confident of her work. "There was once I transformed a man's face and chest to look like Venom, the evil form of Spiderman, and it was so realistic he texted me to say that the cabs he tried to hail did not want to stop for him. At times, she also turns into confidante and counsellor to her clients, like the time she had to console a man who had broken up with his girlfriend. "Sometimes I feel like a mummy to my clients. "I told him that he was still young, it was Halloween, he should get painted and go find someone else," she says with a chuckle. The best part about her job is being able to be part of other people's happy occasions, even if it's for a few hours, she says. "You see the instant smiles after the job is done, especially on kids, whose expressions never hide how they feel. "Sometimes I feel a little sad that the work will be washed away after two to three hours, but the transience of it is something I have come to accept." She has also had her fair share of strange requests: There was a man who wanted her to transform him into Death. Teenagers have also asked her to paint offensive swear words or private parts on their friends' bodies, as a joke. For the record, she's turned both requests down. But it's not all strict and straight-laced. There are unforgettably funny characters and moments which make precious memories, like the man who kept flexing his chest muscles while she was painting him. "He had been working out, and was trying to show off. "His group of friends and I had to to tell him to stop. We all had a good laugh." She also remembers a man who wanted his pot belly to be transformed into a target board for darts. "He was very pleased with the completed project, and declared that he was going to meet his girlfriend and parade down Orchard Road with it exposed," she says with a tinge of pride. 1. Always keep a pack of wet wipes with you. They help in asking a client with body odour to freshen up. 2. Stretch before a paint session. It will minimise the aches that will plague you later. 3. Painting on the hand of a grumpy child can help divert his or her attention, so that he is no longer fearful about getting his face painted.